Tennis superstar Rafael Nadal, 28, is following in the dubious footsteps of many sports stars turning to questionable stem cell “treatments” to relieve what ails them and potentially extend their careers. Nadal (pictured at right in image from Wikipedia) will receive what appears to be a laboratory-grown stem cell product from Dr. Angel Ruiz-Cotorro. It seems to me to be like an extreme long shot, kind of like a no-look between-the-legs, inside-out forehand that you hope will clear the net and land inbounds, but usually it doesn’t. Update: Nadal apparently got a similar stem cell treatment for his knee last year. it’s hard to know if he thought that was helpful. I’m not clear on what experience or training that Dr. Ruiz-Cotorro (pictured at right) has specifically in stem cells or transplants, but I’m trying to learn more about it. Nadal just got his appendix out a week ago and apparently now in the near future will get potentially risky stem cell injections. One of the concerns about sports stars getting these kinds of stem cell “treatments” is that it will likely encourage amateur athletes, perhaps even children (via their parents) to also get dubious stem cell interventions. 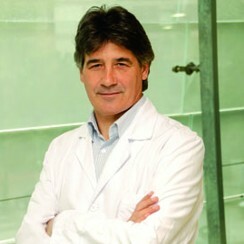 It seems Rafa has used a specialist in PRP by the name of Dr. Mikel Sánchez of the Unidad de Cirugía Artroscópica in the Basque region near Bilbao. There may be some media spin on the use of the term “stem cells” here if indeed they’re using PRP, Platelet Rich Plasma, as that treatment course for sports related injury is well investigated. I previously recommended it to my Father-in-Law who has played tennis for 55+ years at a national and club level here in Spain, although he hasn’t gone that route but knows of others who have successfully. If the treatment is something else then it would be worth enquiring further as to what is being done and the manipulation involved. Such a cultivation process would typically be used for adipose MSCs, not PRP. Not necessarily adipose MSC. Could be bone marrow MSC. I know from my brother, that a PRP-therapy could work very well. A PRP-therapy healed Osteochondrosis dissecans at the joint of my brother, after seven years. Because of this fantastic result. I am wondering, why the PRP-therapy is only used by some doctors. If you will get more information on Rafael Nadals treatment, please let us know about it. It seems like PRP plus more because it seems they grew cells in a lab. Probably, if he has done it once, it worked. These guys and their managers consider risks carefully. I believe they reviewed well the actual effect for those who already have gotten “dubious” treatment. I don’t buy your argument. Let me use it for a different treatment so you can see that the argument is not valid. German tennis star, Boris Becker, used Homeopathy. He used it more that once … therefore homeopathy works. It is a pity, so many newspapers are writing about this treatment, but no one knows exactly, which kind of treatment Rafael Nadal gets. It would be much more interesting, if Rafael Nadal plays tennis again. Nothing I have read suggests MSCs – media hype over Nadal getting “stem cell” treatment is a Spanish translation issue I believe. If I turn up anything further/different I’ll advise.To be safe I would assume it’s PRP 1st then IF facts show MSCs switch. So I think, it must be something more than PRP. I hope the reporters will ask the doctor to explain his treatment. I’ve looked up Ruiz-Cotorro on PubMed. He has publications indicating expertise in tennis injuries. I presume that he’s collaborating with others who specialize in culturing stem cells for autologous therapies for orthopaedic injuries? If one is to warn people off an autologous, cultured stem cell treatment then one should also mention that the more conventional treatments (high-dose steroid injections and joint fusion) have been found to have huge downsides. We’re not evolved to play tennis/football/whatever so seriously… that’s the real take-home lesson from all these injuries to high-profile athletes. MSCs? Is there already an approved MSC-treatment for the bones/cartilage? If someone knows, please let me know. I thought there are just medical trials. Take a look at TiGenix & MediPost approved products (Europe autologous cartilage cells for knee & Korean allogeneic cord derived MSCs for osteoarthritis respectively) – many other programs are in various stages or clinical trials. Just one other question. Would you recommend to store the mesenchymal stem cells from the milk teeth of my children? Is it true, that the stem cells from the milk teeth have a better quality than the mesenchymal stem cells, you can take from your own body? It’s good to see you’re seeking evidence behind treatments that are claimed to be using stem cells. I wonder if you might log your evidence-hunting journey on http://www.askforevidence.org – because at Sense About Science, the charity running this web tool, we’re interested in evidence behind alternative treatments – especially those endorsed by celebrities. Do tweet @senseaboutsci as and when you find more about such treatments! That´s a very good idea, on this way, it should be possible to get more valid information about these new treatments. It will be interesting, as wll. if Rafael Nadal returns in 6 weeks on the tennis court. ¿Tiene algo que ver la técnica PRGF®-Endoret® con las células madre? No. Son dos vías diferentes de la medicina regenerativa. Platelets IMO are a potential universal treatment with great promise given their benefits shown to-date in medical practice from donor blood. This is something I’ve been following with great interest with the pre-clinical synthetic Platelet work using hESCs and iPSCs, also from the Adult sources (Cord specifically). Thank you for this great information, very interesting. It’ s a pity, that no newspaper reports about this background. Further to the story Paul – your original suspicions were correct, Nadal confirms in an interview that he underwent additional therapy than the previous PRP treatment with an expanded MSC product taken from his BM. It will be very interesting to see, if Rafa really returns to the Centre Court in december. If he will be able to play again, this would be a very strong argument for similar stem cell therapies for the public. There are several institutes offering these kind of treatments. It is hard to evaluate, if these therapies will work. So I am a little bit more optimistic, that the future of these new stem cell therapies has already begun. Thank you for your interesting reports and statements. This is the only page with good and interesting background information. Just take a look at Rafael Nadals facebook-account, He has posted pictures and videos of his training sessions. He really has returned to tennis. Maybe this could be a small evidence, that this kind of stem cell treatment is really successful… ? do you have any additional information about details of this stem cell treatment ?